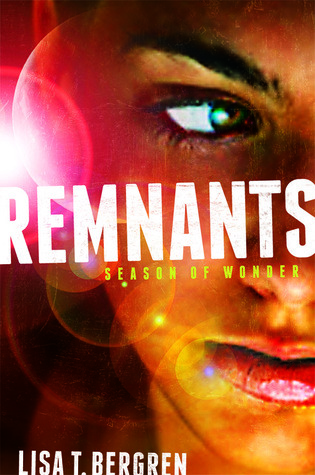 Remnants: Season of Wonder (The Remnants #1) by Lisa T. Bergren. April 8, 2014. Blink. Goodreads. The Sons of Sheol will stop at nothing to prevent Dri and Ronan from rescuing anyone sympathetic to the Remnants’ cause. And as the Remnants attempt to battle the demonic forces, other enemies close in. Dangers intensify, but so do Dri’s feelings for Ronan–the one emotion she is not meant to feel. In the midst of their mission, Andriana must find a way to master her feelings, or risk compromising everything. I am stop #5 for this awesome new book from Lisa T. Bergren! If you’ve followed my blog for awhile then you know I’m a fan of Lisa’s. Her RIVER OF TIME series is still one of my all time favorites. But today I’m excited to introduce you to her newest YA book, Remnants: Season of Wonder, which comes out on the 8th of this month. It’s dystopian with what I feel as a little fantasy vibe. I loved it! My 5 of 5 STARS review will be up tomorrow. For my part of the tour I happily signed on to share a ROMANTIC scene. Shocker I know. 😉 Enjoy! Look at the end of the post for the giveaway. We entered our room, and I knew if we’d had a door, Ronan would have wanted to slam it. He looked at me in fury, his hands waving as though he wanted to shake me. “What was that?” he whispered fiercely. “That was a conversation. Fact finding,” I whispered back. His river-green eyes searched mine, going back and forth, until he lifted his head, angrier than ever. “Quit reading me.” He shook his hands as he turned away, as if shaking out a silent scream of rage. He walked out onto our balcony, leaned his arms on the wall, and hung his head. I sighed and then padded out after him. “That’s not fair, Ronan. Telling me to not read you. Don’t you try and read me all the time? Even if you don’t have the gift? It’s just part of our nature. That desire to connect.” After a moment, I wrapped a hand around his arm, feeling the lovely strength and steady pulse under my fingertips and more. He was a swirl of emotion. I swallowed hard, the hint of his struggle against his attraction to me right there at last. I knew of what he spoke. The incessant need to be close, and yet to stay adequately apart. To not give in to our attraction. To not disobey the elders … elders who’d set down this rule for a reason. I knew he’d give his life for me. But if we were entwined further … if I held his heart and he mine, we might make decisions not for the good of the Ailith as a whole, but for each other. But oh, how the admission thrilled me. It wasn’t my imagination. It wasn’t one-sided. I made myself drop my hand, not wanting to torture him. But as my hand left his arm, he straightened and caught it in his. He ran his palm against mine, separating my fingers, weaving in his own. We stood there for several long moments, frozen by our wordless admission, staring out, holding hands, simply feeling the glory of skin against skin. Not just a friendly hold, but a hold that spoke of so much more. Excerpt from Remnants: Season of Wonder © 2014 Lisa T. Bergren; used by permission. LAUNCH TOUR CLUE #5: IN CALIFORNIA. Collect all 26 clues, gathered from each of the Launch Tour stops this month, and you could win a Kindle Fire HDX ($229 USD). Open internationally. At the end of the month, just go to LisaBergren.com and enter the completed clue stream in the Rafflecopter (available after April 30, 2014). Comment below, noting your favorite dystopian (so far), or one you intend to read, and you could win a copy of REMNANTS, hot off the press! GIVEAWAY IS CLOSED! RANDOM.ORG HAS SPOKEN AND LOREN IS THE WINNER! CONGRATS. Remnants Wonder(ful) weekend! SIGH!!!! AWWW they are so cute!! The group of teens in the story are so fun to read about! Lisa Bergren is one of my favorite authors! Thanks Adrienne! I’m glad you’re loving it. Seems I am to late fo win a copy of the book, Never the deadline for that was 4-30. Oh well! I’m enjoying stopping by and reading everyone’s Remnant’s thoughts and posts. Great excerpt. And favorite dystopian so far is the Under The Never Sky Series. Love the excerpt. Congrats Loren on winning! Looking forward to reading Remnants! I have never read this genre. You got me hooked – now I have to read what happens! So far Hunger Games is my favorite. But my daughter says Divergent is better, which I still have to read. Can’t wait to read Remnants. I’m looking forward to reading Remnants, I am loving all the Dystopian novels that are coming out! The excerpt is sweet and endearing. I look forward to reading Remnant. My favorite is the Chemical Garden Trilogy by Lauren DeStefano. My favorites so far are The Safe Lands books by Jill Williamson, but there are so many good ones that I’ve read or have yet to discover. I didn’t know she had a new book! this one looks so good. I loved the Hunger Games trilogy. I’ve enjoyed Anomaly, and I’m in the process of reading Luminary…both by Krista McGee. Would love to win Remnants. I’ve read books 1 & 2 in Jill Williamson’s Captives series and am looking forward to #3. Can’t wait for this one! Thanks for that convenient goodreads link — just added Remnants to my TBR list. The River of Time series is a favorite of mine, and I look forward to reading a YA dystopian by Ms. Bergren. I’ve reread The Hunger Games a few times b/c I’m hooked on Collins writing style, but my favorite dystopian series is the Legend series by Marie Lu, which I discovered thanks to this blog — so thank you Kathryn! Wow! What a treat! Thank you Kathryn and Ms. Bergren. I don’t know if I could pick a favorite of the dystopian books I’ve read but some I’m planning on reading are, Remnants, The Maze Runner, Matched, and Partials! Thanks for the giveaway! Thanks for hosting me, Kathryn! So appreciate your support! I intend to read to Anomaly by Krista McGee.